B.C. construction workers should see pay raises of more than 10 per cent over the next two years, according to the results of the Independent Contractors and Businesses Association’s (ICBA) 2019 Wage and Benefits Survey. But there is a sense that storm clouds are gathering on the horizon for this vitally-important industry. ICBA President Chris Gardner released the results of its annual survey of 1,000 construction companies Wednesday morning at ICBA’s 22nd annual CEO Breakfast, kicking off the BUILDEX construction tradeshow at the Vancouver Convention Centre. Construction in B.C. now employs nearly 250,000 people and contributes almost 9 per cent of the provincial GDP. This year, survey respondents said they expect to give their workers a 4.8% raise; in 2020, they expect another 5.3% increase. That’s more than double the rate of inflation. Interior: 37% of contractors expect more work in 2019 than last year; 78% say they are short of workers, especially labourers, carpenters and framers. 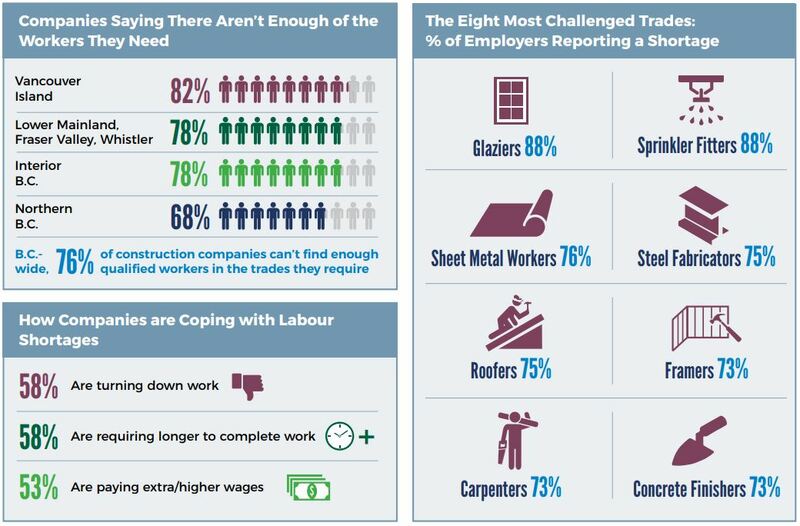 North: 64% of contractors expect more work in 2019 than last year; 68% say they are short of workers, especially carpenters, labourers and welders. Vancouver Island: 29% of contractors expect more work in 2019 than last year; 82% say they are short of workers, especially carpenters, labourers and plumbers. 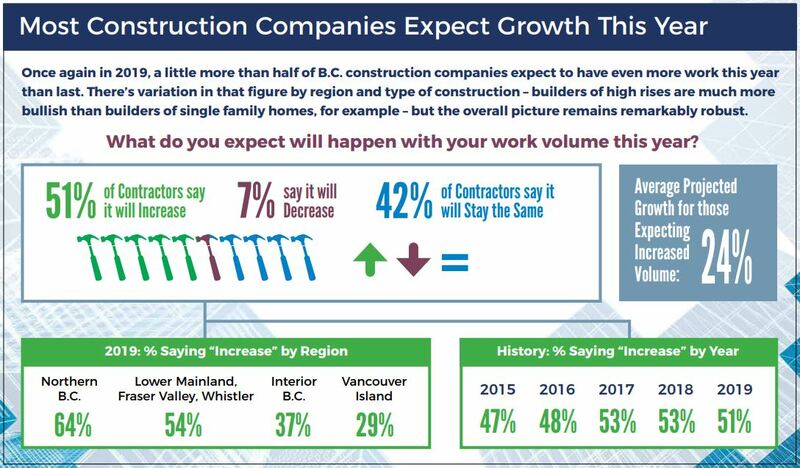 Lower Mainland: 54% of contractors expect more work in 2019 than last year; 78% say they are short of workers, especially carpenters, labourers and plumbers. But construction company owners are worried about the direction the B.C. Government is taking the economy. Of those surveyed, only 8% said John Horgan’s NDP government was on the right track in dealing with businesses like theirs. More than half – 51% – said Horgan was on the wrong track, while another 41% said they didn’t know. See the results of the 2019 ICBA Wage and Benefits Survey, including several infographics like those below, HERE.